Mental illness is a disorder that affects your mood, thinking and behavior. It’s not a broken hardware, it’s a broken software, and we all know that messed up software can hurt the device which operates it. So why do we treat mental illness like something unreal when it’s something that extremely affects the individual’s reality? According to the CDC, only 25 percent of people with mental health issues feel that other people are compassionate and sympathetic toward them. If the whole world looks at your illness as nothing serious, than you won’t take necessary action to get better. It’s ok to ask for help. There are psychiatrists and people studying their whole life to treat such illnesses and there are many methods and ways to treat them. It’s a tremendous help to have someone supporting you through the process. 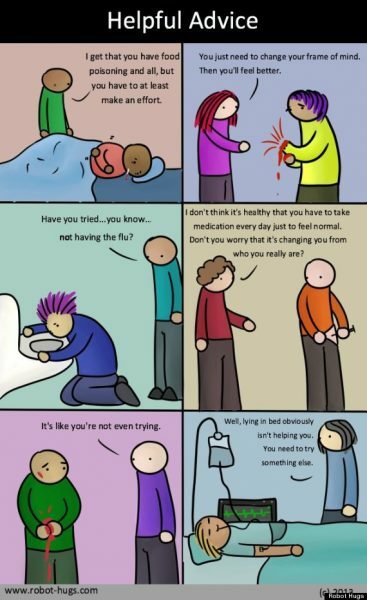 You don’t have to live with a mental illness. It’s sad that some people start to think that’s the way they naturally are just because the world sees OCD or depression as something you can stop whenever you like. Mental illnesses demand strong will, effort, discipline. It’s best to get professional guidance and sometimes even medications if you are advised. Remember that you won’t take medications for long, just until you get better. Many psychiatrists use a combination of medications with various methods to achieve improvements in the mental health of the individual. And that’s the most effective way if you ask me. It’s completely up to you if you’ll get better. If you do what you are told, if you follow the steps and methods, and just try to learn along the way, you will get better. Depression is not your natural state. Whatever you choose can be your natural state. However, you need to work on yourself to get there!